My husband loves ice cream; I mean he REALLY loves ice cream. A few years ago, he decided that we needed to have an ice cream maker. Not a fancy one, just a basic ice cream maker with a small motor. The pretext reason was that we could not find good sorbets in supermarkets back then... We did make a few sorbets at the beginning. However, over the last 5 years, I think we used the ice cream maker only twice (but purchased lots of ice creams and sorbets)! The ice cream maker was sitting in a closet (next to the yogurt maker).. and because of that, the minute we thought about making some ice cream, it was not possible because the bowl was not cold! It also happened that coconut milk was on sale at the supermarket. Not the cans I purchase to make coconut-based curry but the big quarts of coconut milk and because I had never purchased any before, I thought that it would be perfect to make ice cream. There is nothing exotic in this coconut ice cream. It's very simple and healthy. 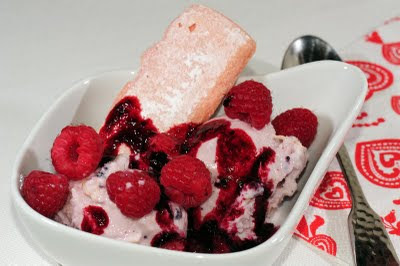 I added raspberries to add fruits to the mixture and to make a coulis (raspberries sauce) to serve with. It was a real hit with my husband and my children who are asking for more! Next time the coconut milk is on sale! Bon Appétit! In a pan, roast the coconut flakes until golden brown. Let cool. Mix the coconut milk with condensed milk and vanilla extract. Put in the ice cream maker and then in the freezer. Roasting the coconut flakes makes a real difference in taste. Don't skip this step and make sure you purchase unsweetened DRIED coconut flakes. Don't put whole raspberries in the ice cream because they'll never thaw and won't be easy to chew on, especially for the children. You would make the same ice cream with strawberries. You could use unsweetened condensed milk and then use honey/agave syrup/powdered sugar to sweeten the ice cream. That is yummy! Santa Claus, bring me a ice cream maker!